Tradesmen love the Red Wing brand – that’s just the way it’s always been. 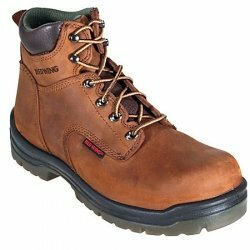 The company has been around for decades and is often considered one of the most reliable work boot manufacturers around. But what is it about their designs that make them so highly sought after? This was the question on my mind when I started doing research on the brand and their work boot selection. I spent several hours reading about the company, their offerings, and the reviews they’ve received from over a hundred verified buyers. And what I’ve come to learn is that Red Wing could potentially be the ultimate choice if you’re in search of a work boot that will take you the extra mile during those hard days at work. Taking a glance at their selection, it’s not hard to see that they all cost a very pretty penny. But with work boots, you get what you pay for. So when you shell out that hard earned cash for a brand like Red Wing, you know you’re getting a pair of boots for the long haul. 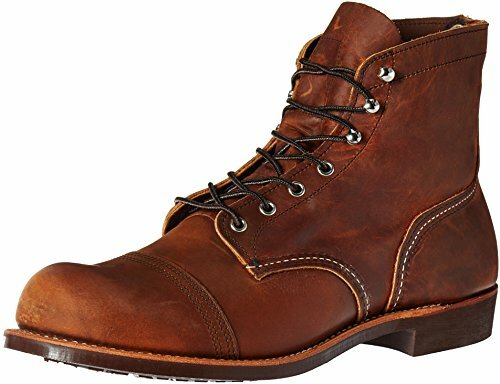 If you’re thinking of buying a pair of Red Wing work boots, then you’re on the right track to a smart investment. How did I come to say that? Well, here are some of the reasons why this brand’s work boots aren’t something you’re likely to regret buying. 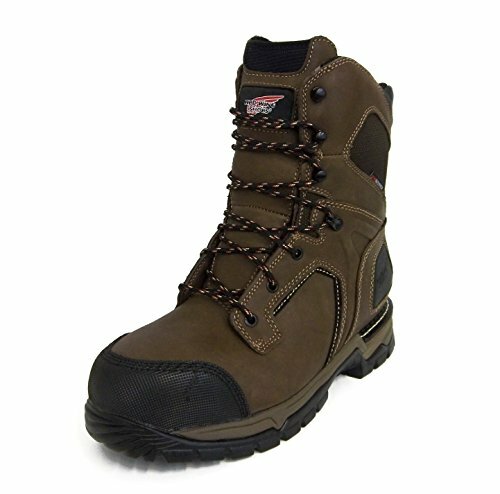 Lots of work boots are designed with stiff, unforgiving uppers to help improve durability and resistance to damage. Of course, these are features we often look for in work boots. But when your feet are restricted and range of motion is limited, it becomes a challenge to navigate your workspace with freedom and ease. Red Wing’s work boot line-up boasts some of the most comfortably pliable uppers you’ll find. The Iron Ranger 6” Vibram Boot for instance, uses specialty signature leather from the company’s own factory. The uppers are treated and stained, giving them a beautiful, rich color that looks even better with age. Stitching that separates the toe box from the rest of the uppers designates a folding line that accommodates flexion of the toes. This reduces the wear applied on other areas of the boot as you walk and move. It also helps eliminate restriction of movement, providing something of a joint that moves along with your feet so you can navigate your space freely. Keep in mind though that Red Wing’s work boots don’t all use the same leather material. Designs like the 8692 Chukka uses nubuck leather combined with synthetic and fabric to give the boot a more contemporary aesthetic. 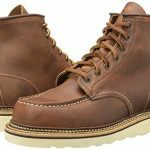 While it is a lot more consistent with choices from brands like Timberland, it isn’t quite as pliable as the other timeless designs from the Red Wing brand. Spilled fluids, cables littered across the floor, and uneven terrain are just some of the many hazards of a blue collar job. So work boots that offer reliable traction on a variety of surfaces and precarious work environments are vital if you want to stay safe on the job. 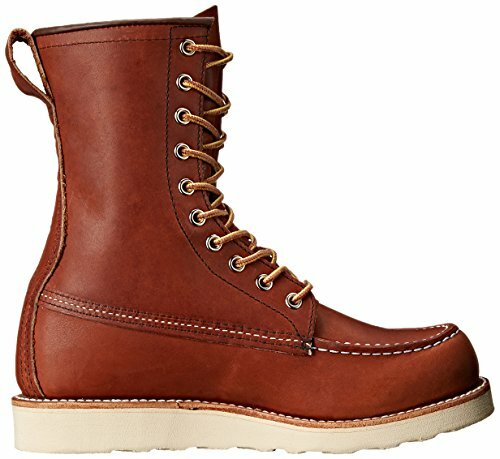 The Red Wing Heritage Roughneck Lace-Up boot could be a great pick if you want something that offers aggressive traction. Its synthetic sole features some of the deepest treads I’ve seen from the brand. They also have quite a bit of height to them, with the heels measuring 1.5 inches and the platforms measuring 0.75 inches for extreme durability and resistance to damage. The Steel Toe Logger Work Boots are another suitable boot for workers who need a reliable bite. The treads closely resemble what you would find on the Roughneck Lace-Ups. The main distinction is the heel height which is slightly taller at 2 inches. 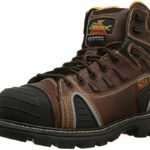 This lets you stand on rubble and debris with greater stability – a common feature that’s essential in the logging industry, thus the boot’s name. Despite their relatively flat looking outsoles, the Iron Rangers aren’t any less efficient with traction. The nitrile cork soles were designed for use on a variety of indoor surfaces, giving you a steady step on otherwise slippery floors. That’s what makes the Iron Rangers a favorite among plumbers, technicians, and electricians who visit clients’ homes. Blue collar workers are almost always at risk of slipping, falling, or breaking a bone because of the precarious conditions they’re made to work in. So for anyone working in this industry, it’s imperative to invest in the right work gear to prevent such accidents. The Red Wing brand yet again impresses with their work boots when it comes to support. The designs fit snugly around the ankles to provide torsional rigidity. But they don’t impede blood flow or restrict movement, which makes them really comfortable despite the solid support. A great testimony to the kind of unwavering support Red Wing offers is the Heritage 8” Moc Toe Boot. 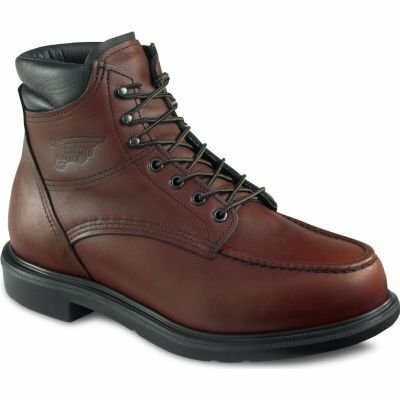 This leather work boot comes equipped with an 8.5” inch shaft that boasts a double leather layer over the heel cup and the toe box. This doesn’t only help lock your foot in place, but also provides extra protection against impact and falling objects. The Beckman Round 6” Boot is another superb choice for support. The boot is slightly tighter than other choices, more than a half-size snug for most users. This keeps the foot from sliding inside the shoe and makes sure that all joints are kept in proper alignment for injury mitigation. To make up for the tight fit though, the boot features a bump toe which provides greater space up front for improved comfort. 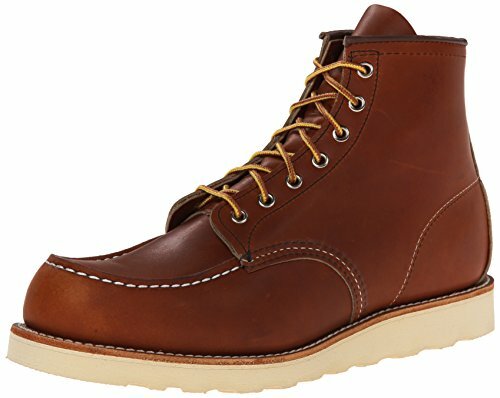 The biggest problem I’ve found with the Red Wing work boot line-up is the fact that sizes aren’t consistent across their models. For instance, the Roughneck Lace-Up runs a size larger. So previous buyers recommended that you select a smaller size. This is in contrast to the 202 Boot which frequently fits a little too tight. So make sure you take your time when choosing a size so you don’t end up with an ill fitting boot. That said, I do want to mention that the Red Wing work boots are exceptionally adjustable. The lacing systems are intuitive and easy to work with, allowing you to tighten up or loosen down significantly with nothing more than a tug here or there. 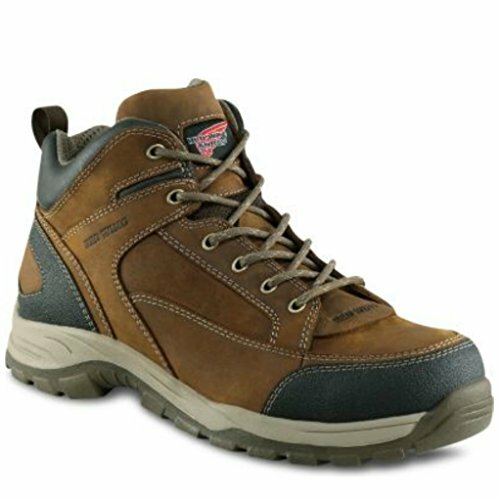 The Red Wing Electrical Hazard Non-Metallic Toe Work Boot for instance, boasts one of the most convenient lacing systems I’ve seen on a work boot. This burly design switches from eyelets to speed hooks closer to the collar, and enables users to adjust tightness with one solid pull of the free ends of the laces. The round, rope-like laces move consistently throughout the length of the uppers and adjust fit with speed. 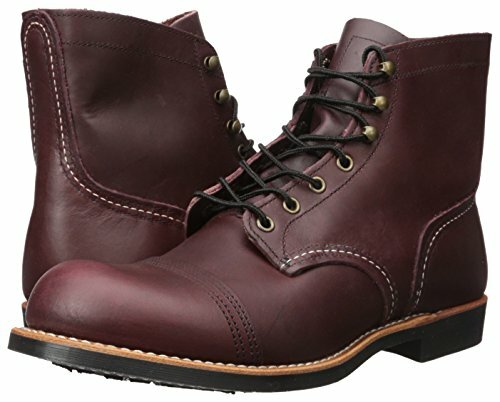 Other boots in the line-up with exceptionally easy and effective lacing systems include the Blacksmith Vibram which trades round laces for flat ones, the Bison Taos Leather 8” Work Boot, and the 8692 Chukka which boasts extra durable, high-density laces that provide superb lockdown all around. Pliable uppers feature unique stitching patterns that designate areas for folding to accommodate walking movements. Different tread patterns and outsole materials bite down hard on a variety of terrain and surfaces. Beautiful leather material ages exquisitely, looking more and more appealing with each use. Supportive designs keep the ankle and feet locked in place to prevent injury. Dynamic laces let you adjust tightness over the entire length of the uppers with little to no effort. Premium build and construction guarantees long years of problem-free use. Some designs don’t offer the same pliability as the leather Heritage line-up. 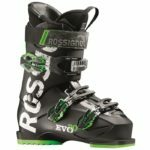 Sizing is an issue as fit changes from boot style to boot style. There’s a reason why Red Wing has been around for such a long time. With their top quality materials, durable designs, and extensive selection, you’re bound to find something that fits your fancy when you check out what they have to offer. 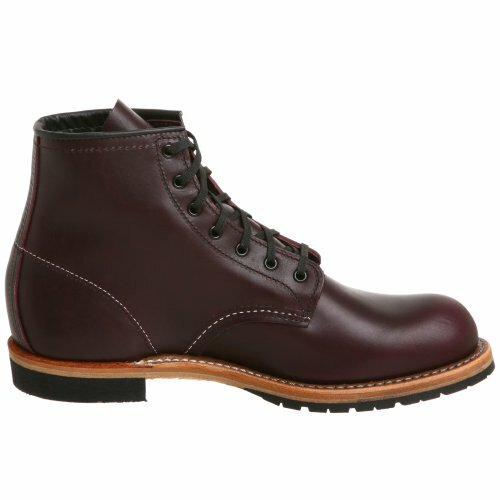 So, without surprise, I can proudly recommend Red Wing to anyone in search of a work boot brand that they can rely on through the daily grind. Just a word of advice, though – sizing can be tricky. 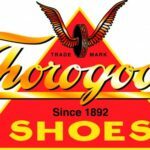 If you like using your own footbed inserts or if you’re particularly keen on fit, then take your time before you settle on a purchase. The boots from the brand seem to have a fluid sizing standard that changes from style to style. So be sure to read what other users have to say to find out whether you need to jump up or down a size. 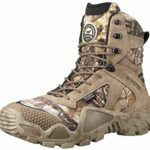 Timberland PRO Pit Boss Review – Is It the Best Work Boot?